The ultimate couch fragger gibfest! Armed with a powerful shotgun, bullet deflecting shield and power-up tarot cards, 2 to 4 local players will battle it out to collect each others souls in 9 different competitive game modes across 4 realms and 40 arenas. 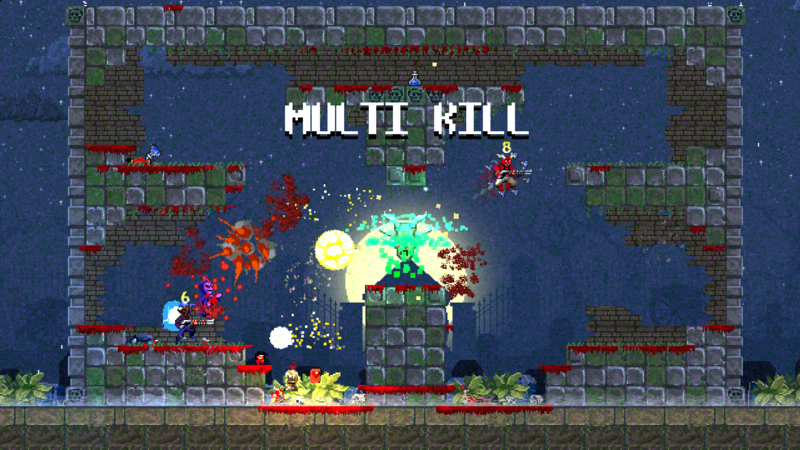 This is frantic local multiplayer action at its bloodiest! I've always loved competitive multiplayer games, growing up on games like Doom, Unreal Tournament, Quake, and Duke Nukem 3D. These are my favorite type of games to play. High action, twitch based shooters. Sometime in early 2012, after playing the classic Super Mario Bros. Battle with some friends, the idea of developing a local 4-player multiplayer game in similar vain has always stuck with me since. Fast forward a bit to early 2013, after creating a Unreal Tournament demake for the Ludum Dare game jam, I decided to take the idea of "Unreal Tournament on SNES" and run with it. After many design iterations, the idea ultimately morphed into what you're seeing today. 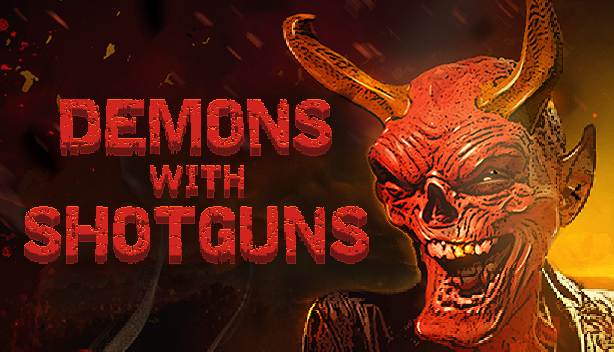 The making of Demons with Shotguns has been chronicled in Angels, Devils, and Boomsticks: The Making of Demons with Shotguns by David L. Craddock, which follows Nicholas DiMucci as he conquers his fears and pursues his dream of releasing his first commercial video game. Frantic local multiplayer, twitch style, arena shooting action! Multiple playable characters. 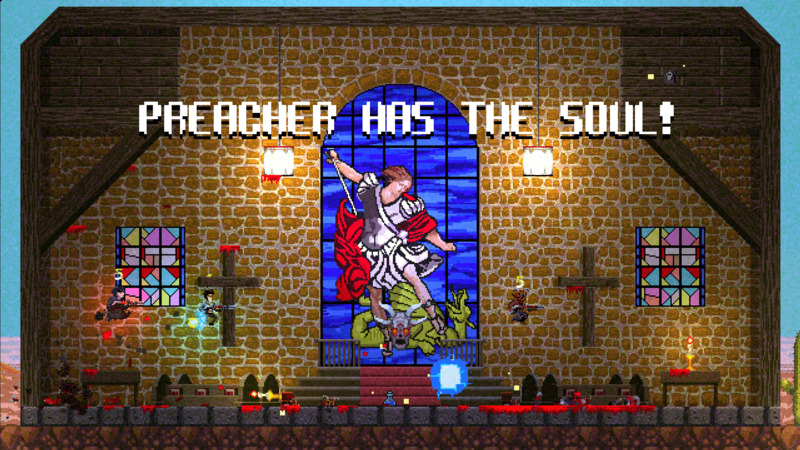 Play as the faithless Preacher, the desperate Demon, the Heavenless Angel, the Antichrist Deceiver, the peace keeping Nun or even Death himself. Choose from multiple game modes, including free-for-all and team based modes. Battle it out in 4 different interactive environments, with 10 arenas each, featuring unique environmental hazards and mechanics. Pick up randomly dropped tarot cards that can either bring you good luck to you or your team in the form of a temporary power-up, or can curse your opponents, giving you a competitive edge. Deflect bullets back at your opponent with your shield. Dash across the arena to make a quick escape or a trail blazing kill. Master shotgun jumping to reach high platforms and create shortcuts. An original soundtrack by VHS Glitch, famed synthwave composer. Featuring the epic voice of Jon Bailey from Honest Trailers. 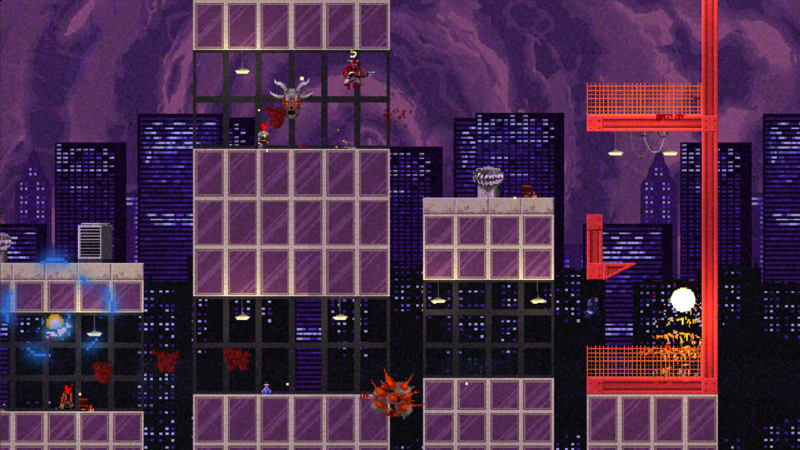 Fend off the Devil's army and prevent the end of times in a 1-2 player enemy wave mode. 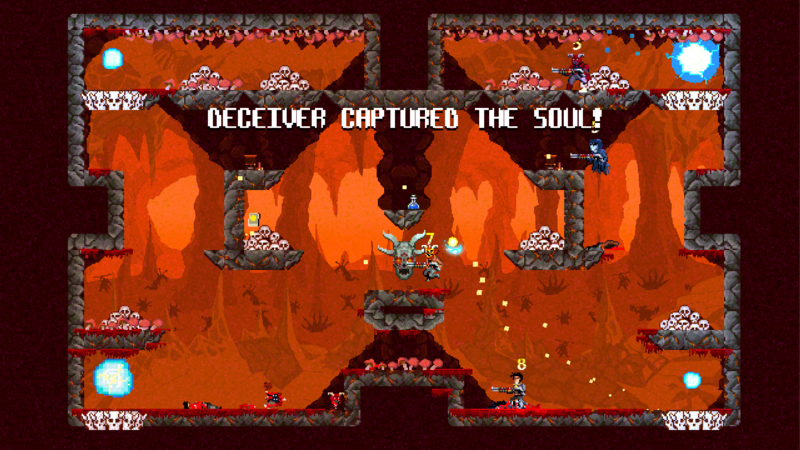 Face off against 6 different types of enemies, including the Nomed, Glut, Rocket and Hellhound. Fight in 5 different unlockable arenas and fight your way to an epic boss battle against the Devil himself. Collect the souls of your enemies and earn a 1UP. Fight at Death’s Cemetery and uncover each labyrinth's hidden passages and secret hideaways while avoiding booby traps. 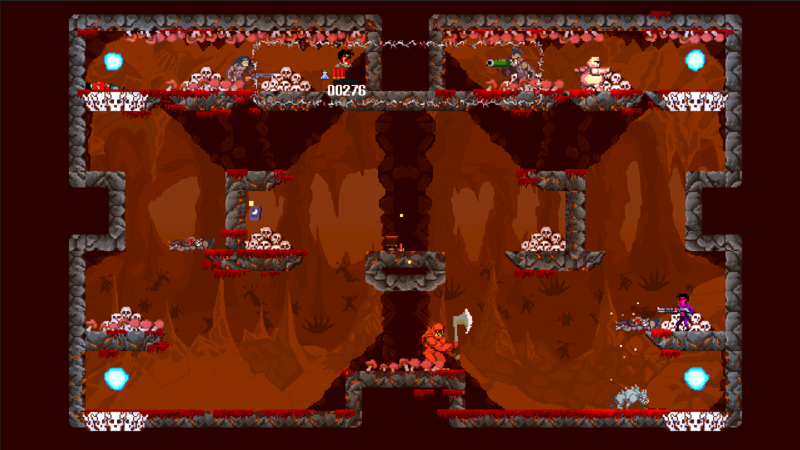 Square off in the abstract and bizarre caves of Hell, using portals to traverse levels while avoiding lava pits. 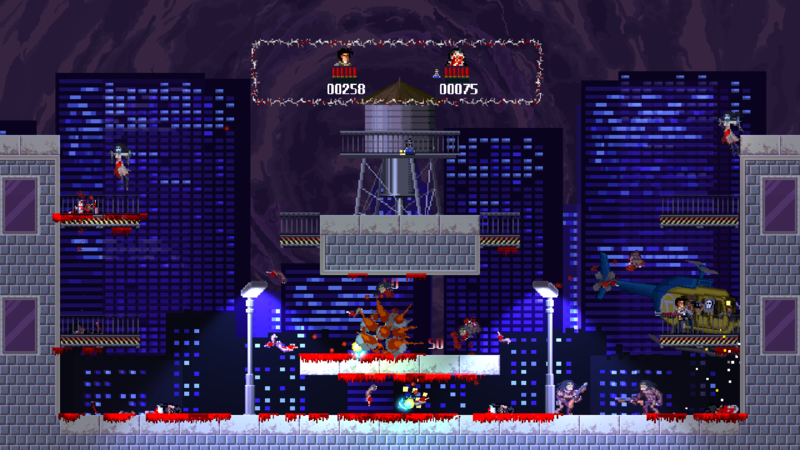 Showdown on the rooftops and streets of a mega city, avoiding long drops and managing moving platforms. Confess your sins, then commit a bunch more, before the church altar. There are far more images available for Demons with Shotguns, but these are the ones we felt would be most useful to you. If you have specific requests, please do contact us! Nothing as of yet! But there's no doubt that Demons with Shotguns will sweep the GOTYs. No doubt. None at all. Demons with Shotguns on Show Important! "Rematch in the Key of Wu" - Some Damn Games - Demons With Shotguns! MindShaft Games, LLC. is an independent game studio out of Seymour, CT, founded in 2013 by Nicholas DiMucci. 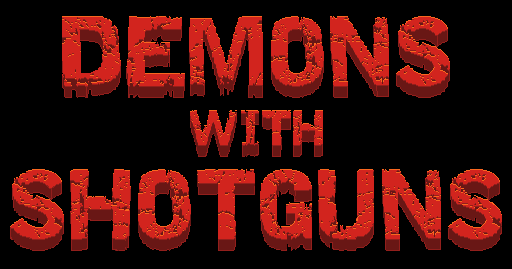 Nicholas DiMucci has been making games since 2009 and is currently hard at work on MindShaft Games first major release, Demons with Shotguns. The goal with MindShaft Games is simple. To make games we really want to play, and hope others want to play too! More information on MindShaft Games, LLC, our logo & relevant media are available here. Founder & Lead Developer, MindShaft Games, LLC.